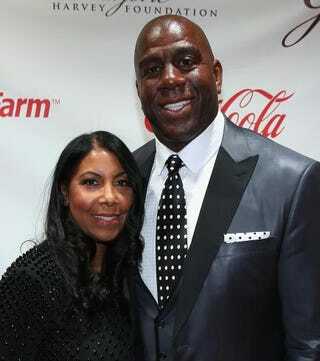 NBA Hall of Famer Magic Johnson and wife Cookie attend the 2014 Steve & Marjorie Harvey Foundation Gala at the Hilton Chicago on May 3, 2014 in Chicago. During a recent Anderson Cooper interview, disgraced Los Angeles Clippers owner Donald Sterling had a few unsettling words about Magic Johnson. The interview was supposed to be Sterling’s apology for his racist rants, but it soon turned into a "Dump on Magic" segment. Apparently Sterling has a huge ax to grind with the former Los Angeles Lakers star and entrepreneur. "He's a good person," Sterling said of Johnson. "I mean, what am I going to say? Has he done everything he can do to help minorities? I don't think so. But I'll say it, he's great. But I don't think he's a good example for the children of Los Angeles." Contrary to Sterling’s personal beliefs, Magic Johnson has done plenty to help minorities since leaving his hardwood days behind him. Johnson has become a voice on how to not only invest in urban communities, but also to give back to them. In 1991, Johnson created the Magic Johnson Foundation after announcing that he had contracted HIV. That following year, he joined the National Commission on AIDS, and called for the expansion of Medicaid to cover all low-income people with AIDS, but he soon left the organization after realizing those recommendations were being ignored. To this day, Johnson is still an advocate for underserved populations when it comes to HIV and AIDS awareness. In addition to his participation in health outreach, Johnson sits at the head of Magic Johnson Enterprises, a company that has a net worth of $700 million and includes: Magic Johnson Productions, a promotional company; Magic Johnson Theaters, a nationwide chain of movie theaters; and Magic Johnson Entertainment, a movie studio. Magic Johnson Theaters are commonly found in urban areas that lack big-name theaters. The theaters provide not only a source of entertainment in local communities, but also provide people with jobs, as well as health coverage. Have you ever wondered how a Starbucks ended up in Detroit? Johnson was also responsible for bringing Starbucks to the ‘hood’ after purchasing 125 Starbucks stores under the Urban Coffee Opportunities. Because of Johnson, people in urban areas like Detroit, Washington, D.C, Harlem and Crenshaw were not only able to enjoy a tall soy latte mocha-whatever, but once again, the venture served as a way to get people in that area into the workforce. Johnson has proven to not only be a force to be reckoned within the philanthropic and entrepreneurial areas, he’s also taken his talents to media. In 2012, Johnson launched the ASPiRE cable network as an effort to bring positive, uplifting images of African Americans to cable television. So far the network is available on Time Warner Cable, Dish Network and DirecTV. So you see, this is just a short list of what Johnson has done that has had a direct effect on minorities. Maybe Sterling should have done a simple Google or Wikipedia search, or even asked Johnson himself before sounding off publicly. If Sterling would have shared what he’s done for minorities, besides bankrolling V. Stiviano, then maybe people would have an easier time accepting his apology. Nah, I doubt it.